I had a chance to sit down with Heather Cox of Certify My Company recently and ask her a series of questions around supplier diversity and certification. We talk about LGBT certification, women-owned certification, disability-owned certification, veteran-owned and minority-owned, etc. She teaches us about NAICS codes, the Small Business Association and her past experience as an acro-gymanst! Hit the play button above or head over to iTunes to listen to her answers. This week I am talking with Heather Cox, the co-founder and Chief Operating Officer of Certify My Company, which is a diversity certification business. She helps women, minority business owners and LGBT businesses that qualify; certify their businesses to become part of the ranks and privileges that certification brings. Welcome to the show Heather are you ready to get started? Before we get into the heavy topic of supplier diversity and certification I have to ask you – how did you get from being a acro-gymnast, tight rope walker and juggler to working in the diversity space? Now that we have a bit about your background lets get down to basics. On this show and on my blog I bring up supplier diversity and certification quite a bit. My goal is to demystify this for my audience. Could you share what exactly supplier diversity is and how it can benefit the business owners listening to this? So now that we have a foundation of what supplier diversity is, could you elaborate more on what certification is and what the process looks like with a specific emphasis on LGBT? Oftentimes when I speak with business owners the thought of going through so many hoops to be certified seems daunting, could you share a bit about how CMC can make that process less painful? It’s evident that you love what you do and are very knowledge in this space. If you could give one piece of advice to businesses owners who are considering becoming certified what would it be? 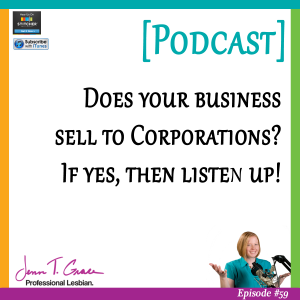 Back in February I had Jennifer Brown of Jennifer Brown Consulting on this show and she spoke about how she uses her dual certification both as a woman and LGBT to her advantage in her marketing. Could you share one piece of advice or nugget of wisdom with the listeners on how they could leverage their status in their marketing efforts? On a similar note, as an entrepreneur yourself. What is one piece of business advice that you would give to your fellow entrepreneurs listening? And our final question of the day – and this question always yields interesting responses. What is one thing about your business that you are really excited about, right now? 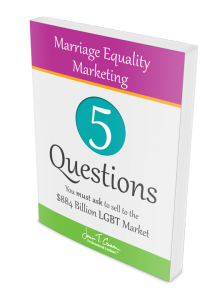 You are listening to the Gay Business and Marketing Made Easy Podcast, episode eight. Hello and welcome to the podcast. I am your host, Jenn T. Grace, and this week we will be talking with Heather Cox of Certify My Company, and we’re going to talk about all things supplier diversity and certification. But before we get into the interview, I do have a couple of announcements. Several episodes back I talked about sharing a win of the week on this podcast, and this week’s win is that I am so incredibly close to knocking off an item on my bucket list which was to write a book. I briefly discussed this in the last podcast but my book is now in the hands of an editor which is super exciting and I have an expected launch date of April 20th. 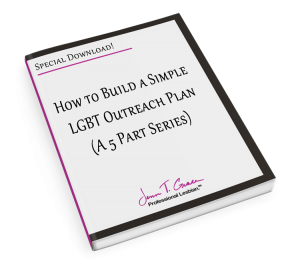 I began writing the book in December and have been plugging away diligently for the last couple of months, and the title of the book is, ‘But You Don’t Look Gay: Successful Communication Strategies for Getting and Keeping LGBT Customers.’ It is your marketing guide to doing business with the LGBT community. As of right now I’ve only really been talking about the book on this podcast, so consider yourselves insiders. But for more insider info you can certainly head over to Facebook at www.Facebook.com/gaybusinessandmarketing which is updated almost daily to keep you up-to-date on new and exciting things happening in the world of LGBT. At the end of this show I will share with you the date of the next live webinar which will feature a Q&A at the end of it, but I would love to just dive into the interview with you right now, and remember that all of the links that we talk about on the show today will be available on the website by going to www.JennTGrace.com/008 for episode number eight. So I am excited to be talking with Heather Cox, the cofounder and Chief Operating Officer of Certify My Company, which is a diversity certification business that helps women, minority business owners and LGBT businesses certify their businesses to become part of the ranks and privileges that certification brings. Welcome to the show Heather, are you ready to get started? I am, thank you Jenn. Excellent. So before we get into this heavy topic of supplier diversity and certification, I have a couple of questions to ask you because I was reading over your bio, and I see that you have some experience with tightrope walking and juggling. Could you share with me and the listeners how you went from that to being in the diversity space? Well it does seem like a natural evolution. However- actually though the tightrope walking and juggling I did in acrogymnastics growing up. I grew up in a very small town in southern California and about 70 years ago a man named Roy Coble started a program for wayward boys and taught them how to do some circus skills. And fast-forward 25 or 30 years or so, it became a youth circus. So growing up, I did, I performed in the Great All American Youth Circus and I learned how to walk a tightrope, and juggle. And we did tour a little bit but mostly on the east coast with a circus called Circus Smirkus, if you want to Google that one. So- I mean occasionally, it doesn’t really come up so often in my life now, although at weddings or different events I will sometimes pick up some oranges to entertain the crowd. But really what it did teach me that was an invaluable lesson is while tightrope and juggling all seem like very individualized sports, acrogymnastics is not because what acrogymnastics is, is it’s kind of a pyramid. If you think about cheerleading squads is the most generic kind of example I can give, where you see there’s a person on the bottom and they all climb on top of that person. So you can’t do any of those stunts, any of those things without the other people. If not, it’s just one person standing on your foot. So you have to have the someone on the shoulders, and there’s someone on the leg and there’s someone doing the split in order to make it a pyramid. So that’s what acrogymnastics is. It’s a different evolution and different variations of these different pyramids, so you can’t do that alone, and just like anything else in business also, it’s very hard to do anything alone. I don’t really- that’s one thing that sticks with me through everything I did, and everything I continue to do, is that you really need people. You need other people because you can’t do it all by yourself. That is really interesting insight and an interesting story to start us off, that’s pretty awesome, thank you for sharing that with us. Thank you for asking, it’s glossed over quite often actually. Well it shouldn’t be because that’s definitely an interesting tidbit and I love pulling out those types of the people that we’re talking to on this show, so thank you for that. And we have a packed agenda today to discuss supplier diversity and certification of diverse-owned businesses. And I talk about this particular topic quite often either here on the podcast itself or on my blog. And I figured you are the absolute perfect person to have come on the show and break it down for us into the basics. So I would love to demystify what supplier diversity is and certification is for my audience. So if we could start there and have you just share a little bit of what exactly supplier diversity is, and how can the business owners who are listening to this by becoming certified? Okay, so we’ll start with supplier diversity. Supplier diversity is really what its name is. It’s the diversification of the suppliers in the supply chain. Typically for all the years of companies buying goods and services, everyone sort of looked alike, everyone was kind of the same type of person, so- and a lot of times the bigger majority of firms if you will, got the full counts of business because they were- you know the white man was doing business with the white man. Well not to cause any stirrings up, but it’s kind of how it went and it was really hard for other people outside that image to break into working- to being part of the procurement process. So supplier diversity really opened those doors to diversifying, as I said, that supplier base allowing women-owned businesses and gay-owned businesses and minority-owned businesses, and veteran-owned businesses into the fold and it just made it that much easier and more mainstream if you will for all those different types of businesses to get into the mix. And because of it we have so many more products and services than we ever would have before. I mean just think of when you go into Macy’s and companies like FUBU, you know I’m thinking of him because of Shark Tank. Like that may have not been a brand that you saw in Macys, you know forty years ago, because it wasn’t the run of the mill kind of brand. So all these new, exciting and fantastic retail pieces that we see, and even services that we see, are really because of the supplier diversity initiative. Now the reason that certification is so important is because it is a third party verification that you are really who you say you are. So now we’re in a place where we all understand- we don’t all understand, but we realize there is a benefit of doing business with diverse-owned companies. So a lot of times- and with these initiatives, there is some set aside, there are some internal and externally set goals for companies to spend a certain amount of money or a percentage of their overall spend with these suppliers. So there are always those people who want to take advantage and so they’ll say, “Oh yes, my wife owns the majority of the company,” when yesterday she was the secretary who worked two days a week, and now she’s the CEO of the trucking company. So in order to keep that from happening and protect those of us who really are women, minority, and/or LGBT-owned companies, certification has come about. So this is what protects us, it’s a third party verification that proves that we really are beyond a shadow of a doubt who we say we are. That is excellent, a good description. One thing that you did just mention that I don’t know that everybody will know what it is, is procurement. Could you elaborate on what procurement is briefly? Sure, so procurement is buying. It’s the people, the professionals in any organization who do the buying. So a lot of times you’ll hear a procurement professional or procurement enterprise, and that’s just the buying for the most part. And we all procure, I mean even the smallest company has to buy office supplies and has to buy legal services, and has to buy- you know has to procure these things, and so procurement is just the buying of goods or services. I remember when I first started learning about supplier diversity and certification and all that stuff, and it was probably at least six or eight years ago, I remember procurement being thrown around all the time but when I was talking with people, they were explaining it in such a complex way that it just never made any sense to me for a long time. So I’m glad that you really just put it down in basic terms. So thank you for that, I’m sure those listening will certainly appreciate it. One other thing that you were just mentioning, is the third party- it being a third party certification and it’s there to protect the people who are actually going in for the certification. So in terms of the third party, who are those third party sources that are actually doing the verifying for LGBT, women, minority-owned or people with disabilities or veterans? Okay, that’s a great question because there are definitely- so we’ll start with the big three, if you will. The big three are the women, minority, and LGBT certification. So the biggest ones, the ones that get the most press at this point in time I would say. So for the women, it’s WBENC which is the Women’s Business Enterprise National Council. And I will throw around this acronym 100 times, WBENC, WBENC, WBENC. That is the gold standard of certification for women-owned businesses. For the minority businesses, it is NMSDC; the National Minority Supplier Development Council. And again, they are the gold standard of certifying your business as a minority-owned business.  Now for the LGBT certification, it’s the NGLCC; the National Gay and Lesbian Chamber of Commerce. And they are really the only certification at this time that is really well-known as an LGBT certification to prove that your business is really controlled, owned and operated by one or more LGBT persons. Jenn, real quick before I forget, because I did start with the big three, there is also- as you mentioned, you alluded to the veteran-owned business and also disability businesses. The disability is really certified through the USBLN. Now, I know I really should spell out what that stands for, but I can’t think of what it is right now. And I can’t help you even though I know I should know this. But at any rate, for those listening, every one of these podcasts has a blog with show notes that goes with it, so I will make sure that I am putting the links and the names of all of these businesses that Heather is bringing up and additionally I will make sure that we figure out what USBLN stands for and make sure that we spell that out. Yay, Jenn. Good together. See? We need people. So the veteran-owned business, there’s a few different avenues you could go to, and I know this is a highly controversial certification, but it is an important certification. And it is very difficult certification on top of everything else, because for a long time it was just, ‘I’m a veteran of a business.’ And now with- though they’re really trying to protect, again protect this group of people who for so long were being taken advantage of and being used as pass-throughs for larger companies. So there’s a few different options; you can do it through the VA, you can do it through some various organizations. But it really is important that if a company is a veteran-owned, majority owned, operated and controlled by one or more veterans, they should be certified to protect them, and it’s a fantastic marketing tool that is a very hot topic right now. A lot of people will ask me about small business certification, so I just want to mention it. There is actually no small business certification outside of the WOSB certification, which is the Women Owned Small Business certification. The Women Owned Small Business certification only covers 87 NAICS codes- the N-A-I-C-S codes, and those were set aside by the SBA as the ones that are significantly under-represented by women-owned businesses. So other than that, to be verified as a small business, you have to go onto www.SAM.gov, and www.SAM.gov you put in a lot of information that’s going to take you probably about 90 minutes to complete the entire process if you do it correctly. I just got a call from a client that told me it took her ten minutes, so I knew in an instant that she did not complete the process, and she had not in fact. So- but you put in a lot of your information and that is where it will confirm that you are indeed a small business enterprise, and designated by your NAICS code and the thresholds set by the SBA by either your annual revenue and/or your employees- the number of employees that you have. So when a corporation asks, or when the government asks, ‘Are you a small business enterprise?’ You can say yes, and they will be able to look up your verification in www.SAM.gov. Interesting, and you just threw out a ton of acronyms that I am absolutely confident is going to confuse people, so just to go back a couple of steps. I know that you were talking about the NAICS codes, and the 70-something that women are notoriously under-represented in. Could you just explain really quickly what exactly that is? Is actually because that wasn’t specific enough, they now have a whole new list of codes which the UNSPSC codes that are even more specific. So within like digital marketing, it will have even more of a more specific breakdown. Or for example with the SIC code if you’re a staffing agency, it would just say ‘Employment’ maybe. But with NAICS it would break it down between temporary or permanent. Now with the UNSPSC codes it says, ‘Clerical Temporary, Clerical Permanent.’ It will say, ‘Legal Temporary, Legal Permanent.’ They’re more specific codes. So the SBA, the Small Business Association, when they were trying to determine how to break all this information down, they utilized the classification codes. And they still really, really utilize that NAICS code and they have decided that there is 87 of the thousands of NAICS codes that are significantly under-represented by women. And that’s where we get to that women-owned small business certification. And what type of industries would be in those codes? You know it’s funny that you ask that, because sometimes I look at them and I’m thinking, ‘That’s really funny that that is one of them, because I don’t think of it as an under-represented,’ but there are legal services in there, construction services, even like telemarketing for example is in there but it has its own- it has a few specifics around it. But it’s really anything you think of like messaging, trucking, those transportation type industries that you would think of as significantly under-represented. So things that you would notoriously think of as a male-dominated field. Absolutely, that’s the best way to put it. Okay. So we’re talking about a lot of the stuff here, and again I will make sure that I’m including links and information where possible around these specific things because a lot of this isn’t stuff that I’ve discussed before on my blog. So I will link to all of these sites and give brief overviews of these codes, because for business owners who are interested in this process, once you start the certification process, you will immediately start to recognize all these things that are coming up and then hopefully you have a leg up on actually filling out this application which we will get to in just a couple of minutes. But I want to talk about misconceptions really quickly, because I imagine that as people are listening to this right now, somebody out there may be thinking, ‘Well just because I’m a woman, or just because I’m LGBT, or just because I’m a person with a disability, I don’t want to get business based on that merit alone.’ So is that something that you hear often, and if so could you talk to that a bit? Yes, I love that. You will never- I will say never, I rarely use the word never or always. You will never get a contract specifically because you’re a woman, or a minority, or LGBT, or disability, or a veteran. What it is, is a marketing tool. Not a magic wand, it is not an, ‘if you certify, they will come.’ It is a marketing tool, that it’s to be used for marketing purposes. So if you are part of a request for proposal, an RFP process, and it’s you and somebody else and your companies are so similar. In size, in reputation, in what you do- if everything is so similar, sometimes it very difficult for the procurement people to choose, but if you have a certification that gives them an additional benefit to working with you, you now have that differentiating factor that the other person doesn’t have. That’s really great information to know because it does provide you with a competitive advantage. Absolutely, and that’s really the key. Is that it’s a competitive advantage that- you know the same person that told me it took her ten minutes to do www.SAM.gov, said that in twelve years of being in business she’s never been asked for her certification. I don’t doubt that that is true, but there’s a lot of things that you don’t notice, that you don’t find out about until you’re part of that world. You know there’s so much opportunity around these certifications, and I know that Jennifer Brown spoke about this when you interviewed her, but all the marketing and sales pieces that go along with it that it’s a shame not to have it if you can get it. Absolutely, and if you can get multiple certifications you should certainly consider doing that as well, because there is overlap in the LGBT, women and minority categories, so- or actually in all of them and in disability and veterans. So there’s a lot of overlap there, so if you do qualify for multiple, of course it would be recommended. I hold two certification myself, the women-owned and the LGBT-owned which I use to my advantage as much as possible, because businesses and corporations are looking for those certifications. So along those lines, I would love to hear from you how you think that having the certification, how you can play it to your marketing advantage. Because you had just mentioned Jennifer Brown, when she was talking about how she used it to her advantage, I know that you yourself are a woman-owned certified business. So what advice would you give to somebody considering certification in terms of how they could leverage that in their marketing efforts? Yeah, so as I said certification- and Jennifer also shared this great information, it is a marketing tool. And you really- each company’s certification needs to be utilized uniquely to them. While it is a one size fits all certification in the fact that any company- almost any company who is a woman-owned, or almost any company who is LGBT-owned should get the certification. Because you’re eligible for it, you should definitely get it. The use of it, the way you actually utilize that certification is going to be unique to each company. The way you use your certification is not going to be the way someone who’s in a promotional items company, or a law firm is going to utilize their certification. Because A) you’re marketing to different people, to different companies, different types of companies, different sizes companies. There are so many intricacies about the use of your certification that it’s specific to a company. So that’s one of the things that I really try to focus on with our clients is first of all, which certification is right for them based on their company and who their target market is. And then once they get that certification, how to utilize it. Do they need to be reaching out to the Fortune 1000 direct? And there are so many steps in between that from the registration of your company on each of the diversity portals to going to all the different networking events, to following up. Because in any sales type goal it’s a relationship that you’re building. And you know as well as anybody else that people buy from people, they don’t buy from companies. They don’t like you, they’re not buying from you. That’s pretty much the way it works, right? So if you can utilize- you know you have to build the relationship, but what the certification does is it gives you an introduction. So when you go to these national conferences, and the more certifications you have, the more conferences you get to go to and really utilize- you have that basic face time, that relationship building opportunity with the supplier diversity managers and sometimes even the procurement manager and professionals that attend the conferences. But additionally, and almost as importantly if not more importantly, that for example, there are 300 to 500 other NGLCC certified businesses. They all buy stuff. So you should also market to them. There are over- I want to say, and don’t quote me on this number, over 20,000 other NMSDC certified businesses. They all buy stuff, you can sell to them. And WBENC has over 11,000 other certified businesses, you can also sell to them. So- and what most of the people within these networks do, is they really try to buy from other certified businesses because A) they understand the arduous process you’ve been through to get to where you are. But also we all have to support each other, because we just had this Small Business Saturday a few months ago. I really am under the impression that every day should be Small Business, or Diversity Business Day. We should always be buying from each other because if we don’t, how can we expect the other companies to do it? The majority owned companies to do it, the Fortune 1000’s to do it. That is such a brilliant statement, it truly is. No that’s totally spot on, and if someone were to ask me that exact same question of how should you be leveraging this and using it to your advantage? I would have said to be doing business with each other, because exactly for the reasons you’ve just outlined. Because we are all in it together, and if we want the majority to purchase from us, we should be purchasing from each other. So I know that I make it a point to work with and purchase any services and goods from as many diverse certified businesses that I can. Of course LGBT and women are always on the top of my list, and then I kind of work my way through from there. But every- we all have great products and goods and services to offer each other, so we should be purchasing from each other. Absolutely and that’s really where- a lot of people will say to me, “Well I’m just a regional baker. A certification is not going to work for me.” I could give them ten ways that certification will work for them, but again it’s unique to their company. So it really does take some strategizing around your certification and how to utilize that. It’s not just- I can’t just throw out a generic answer for that because it really just depends on that company specifically. So let’s talk about Certify My Company a little bit, because you’re talking about how you can help your clients in terms of helping them build strategies for leveraging their certification. So could you give us an overview of what your business does and the types of products and services that you offer to your clients? Absolutely. We do a variety of different things, and it started out- really it started out where we were working with women-owned businesses, and helping them get through the certification process. And then it blossomed into obviously NMSDC and NGLCC because- I have to mention the NGLCC and WBENC have a fantastic relationship with each other. WBENC really looks at NGLCC as a little sister and vice versa; they really are- and they really do have a great relationship with each other where if you are certified in one of those organizations, a lot of times they will send courtesies to you if you’re not certified in the other organizations, just amongst themselves. They really do work very well together, and I applaud that relationship because it really is again, like we said, about we’re all in this together as suppliers. So Certify My Company, which I often call CMC, we can use another acronym- why not? May as well throw another one in. Yeah. Our sweet spot in our core business really started out as certification assistance. We become project managers for businesses who want to get their certification, whether it be for women, minority, LGBT, veterans. We would facilitate that certification process for them, because it is a very intensive process. It can be very overwhelming, it asks for a lot of information, and whether it be that a company- that a busy business owner just doesn’t have time, or they don’t understand a few of the pieces, or their to-do list is so long that it’s just never going to get done, or they don’t want to give the very private and sensitive information to an assistant; whatever the reasons, there’s a million of them. People outsource it to us, just like we outsource our taxes because we want them done right the first time. People outsource their diversity certification to the experts. Then once you’re certified, as I mentioned, we will strategize with you to determine the best use for your certification for your company. Because as I said it is unique, each person, each company has a unique need and has a unique position and it needs to be represented on how they use and how they maximize that certification. Additionally there are registration, and this is something that’s often overlooked and should not be because it’s so important to the process. That once you’re certified, you need to let all of the companies that you want to do business with know that you are open for business, and that you are a certified supplier. Almost all companies have specific supplier diversity portals that are in addition to their regular vendor portals, and you have to put all your information in there. They will take anywhere from fifteen minutes to two hours, depending on the portal and how much information they’re asking for, and if it’s a finicky portal. So sometimes the two hours that you need entering in the information five times, because it’s just a finicky portal. So let me actually branch off of this question, because I have personal experience of dealing with those finicky portals, and it’s exactly what you just said. They really are- every one is different, most of them are asking for the same information but it’s never in the same order so it’s not like you can just copy and paste it really quickly. So all of us are entrepreneurs, we’re all business owners, we all value our time. So for somebody who is listening to this and is saying, “This process just sounds so totally overwhelming, I can’t even imagine having to go through all this paperwork but then in addition you’re asking me to spend up to two hours filling out information for one company. What would you say to somebody who would be saying that in terms of what is the payoff for them going through the process of registering these portals? And then also to that, how- what type of offering do you have that really streamlines that process for these people? So yeah the first thing I would say is to outsource it because again, on top of it being overwhelming and arduous, some people will say, “Oh I’ll just hire an intern. I’ll hire my high school student to do it.” Okay, no. Because that registration portal is your resume to the Fortune 1000 companies. If you’re going to interview at Pfizer, would you have your high school student do your resume or go interview for you? Probably not. So why would you have them do this very important document? Now what we do with our clients is- no one knows your business better than you do. So we work them to fill out an informational form, so we have the information we need. Because after doing a million of these portals- okay maybe only a few hundred thousand, you get to see a pattern of the types of questions they’re asking for. So we know how to utilize the information and input it to reflect the question that they’re asking. And sometimes it gets confusing because they’ll say, ‘When you buy from third world countries,’ and I’m like, “Well I don’t buy from third world countries, so why are you asking me this?” And it doesn’t let you continue until you answer, it’s mind-boggling, it can drive you nutso. So the first thing is to outsource it, unless you have extra staff lying around which these days most of us don’t have extra staff lying around. Exactly. What tip would you give business owners- and this is something that I’m curious in hearing myself, is that when I first started registering myself in the portals. When we’re looking at that, and looking at that list of Fortune 1000s; so out of the Fortune 1000, we can determine how many of them have a supplier diversity program. Versus going down the list in alphabetical fashion, because I have talked with corporate supplier diversity people who work within A name, for example. And they say, “We get so many requests from people who are putting themselves in the system, and they’re just coming to us because we happen to have a name with A, and there’s absolutely match for them whatsoever. So do you have a piece of advice or wisdom that you would tell somebody to help them determine what companies they should be actually registering in, and not doing it in an alphabetical fashion? Yeah, alphabetical would not ever be my advice. So that being said, it goes back to that strategy piece. Because it could- I have some clients that should not register on a single diversity portal because that’s not their target audience. It just depends on who you’re going to market, because you have to remember marketing to a Fortune 1000 is very time and cost-prohibited; it can be. It’s very expensive, because sometimes they’ll say to you, “We want you here tomorrow for the RFP.” Well a plane ticket tomorrow costs a lot more than a plane ticket in three months. So you have to be in a position where you can shell out that kind of funds potentially. You have to really understand, is that my target audience? Is that who I’m going after? Now if that is who you’re going after and if you are already doing business with the Fortune 1000, you should definitely register on their site because they need to know that someone that they’re already working with is diversity certified. Because that’s how, by the way, we get the majority of our clients, are because the Fortune 1000 says, “We’re working with you, you need to be certified. It’s very important to us-” they’re much more eloquent when they say this. But, “It’s very important to us that our diversity vendors are certified through a third party organization. And if you need help, you can reach out to Certify My Company.” So that’s usually how we get our clients, because every time they do a report, every time an interaction occurs, there are more and more finding out which of their suppliers are indeed diversity-owned, diverse-owned suppliers. And they want to be able to count that spend. They want to be able to report that spend and they can’t report it if you’re not certified through a third party organization. Gone are the days when you can say, “Yes yes, I’m a woman-owned business, and yes yes, I’m a minority-owned business.” You have to prove it now. So my advice would be strategize, strategy. First of all pick out who your target clientele is and understand it, register on people you’re already doing business with, and then just realize that when you go to these conference- and here’s the kind of catch-22 part. Is you might be at a conference and you realize- you see a client, we’ll call it Corporation X, and you didn’t think ‘Wow, Corporation X is a good target for me, but at the networking event the night before they happen to mention for your services.’ So now you want to go up to them and you want to say, “Hi, I’m so-and-so, this is my amazing business, this is what I do, I understand you’re looking for this, this is how we can fulfill your need.” And then they’re going to say to you, “Oh well are you certified?” So now you can say, “Yes,” and you can proudly answer that question because you’ve gone through these diversity certification application processes. And then they say, “Oh and are you registered on our diversity portal?” Now if you say, “No,” that is an invitation for them to shut down that conversation. It doesn’t mean they’re not interested, it just means that that is- they are bombarded by suppliers wanting to speak to them. So if there’s a way- it’s a weeding out process. So if you’re not registered on their portal, then how can they- then they have a reason to say, “We don’t need to continue this conversation.” If you are registered on their portal, then there is more of an opportunity for them to say, “Okay great, here’s the buyer you need to speak to. Here’s the procurement person you need to speak to, they handle your commodity. You know we are currently in the middle of a contract and it expires in one year, so you should start marketing us in six months.” They’re more willing to share that information with you if you’ve met the initial stats that they’re looking for. That’s really good advice, and I was at a conference in Chicago not too long ago, it was sometime in early last year, and I was having a conversation with a really highly respected supplier diversity person. And I was just asking her questions, I wasn’t even talking to her under the guise of trying to sell my business or my services to her, because that just wasn’t a good fit. But I was just asking her like what her process is in terms of weeding out people who are coming to her, because she- like you just said, they get tons of requests on any given day, and especially at conferences. And what she told me will stick with me forever, and she said that if you come to me and you hand your business card to me and I ask you, “Are you registered on our supplier diversity portal?” Or if she asks, “Are you certified?” If you say no then your card is not even going in her pocket. But if you say that you are registered, it goes in the left pocket. But if you say that you are not, it goes in the right pocket which basically means at the end of the day when she’s flipping through those cards in the right pocket, if there’s some service in there that she knows for a fact that she needs and she doesn’t have a pool to choose from, she may come back and contact you to say, “You know what, if you really want to proceed in this process I need you to go register.” But nine out of ten times that’s not the case and all of those cards just go in the garbage. It’s pretty intense, but you kind of have to put yourself in their shoes and think of how many suppliers and how many vendors are trying to do business with them; especially for these Fortune 500s or Fortune 100s. And she also happened to be another company- it wasn’t even the first one I was thinking of, but another ‘A’ name so I’m sure she gets bombarded quite a bit. Exactly. 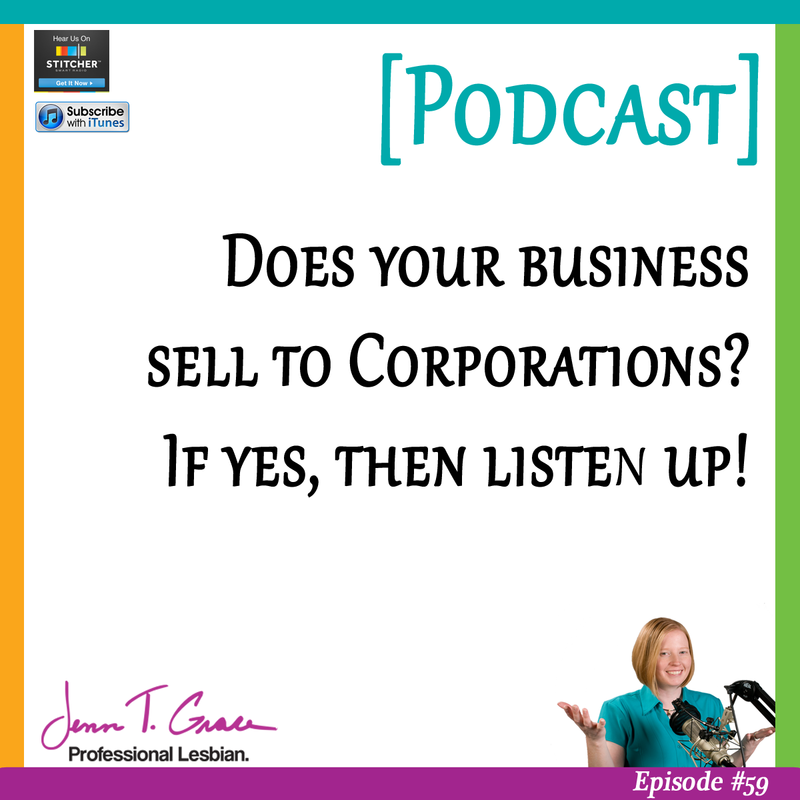 So I’m actually- I want to switch gears a little bit because this podcast is for business owners, and we talk a lot of things about entrepreneurship and how to leverage your status as a diversity-owned business. But I’m curious from just a bare business level, if what your one piece of advice you would give to fellow entrepreneurs listening. It doesn’t even necessarily have to be related to diversity, but just what’s one core piece of business advice that you’ve received that you just hang your hat on? Outsource to experts whenever possible. Do-overs are very expensive both in time and in money. And that could be anywhere from your diversity certification to your legal work to your accounting work to your electrical work in your house; whatever it might be, there is a reason people are experts. Now that being said there are people who are not experts as they would like you to believe, but that being said if you’ve done your homework, outsource to the experts whenever possible. That’s awesome that you say that because on our interview with Jennifer Brown she brought up points around that particular piece as well. So this is something that I feel like most entrepreneurs understand or at least if they aren’t at a point of being able to outsource right now, it’s something that they at least know should be on the top of their priority list. It is so important because you know you hear- I work with lawyers a lot in one way or another. And there’s a reason that even like lawyers and doctors are experts and there’s such respect. You know it used to be that fifty years ago, you were a doctor, you were a doctor for the most part. But now there’s people who are specialists in the right eye, just the cornea, of just the right eye. So there’s a reason for that because you become so knowledgeable around that one piece of information and there are people who I work with whose legal documentation for their company is such a mess. If they would have just utilized a lawyer and paid that $1,000 they would have been done with it. And let me tell you one of the best by-products of the certification application is it is a fantastic housekeeping tool. Your paperwork for your company is going to be triple-checked over and over again. And that’s one of the reasons that people really respect a company who’s gone through the process is because they know that your paperwork is in serious order now. Because all their I’s have been dotted and your T’s are crossed. And I was working with a woman who runs a very large company and it turns out that where she is, she didn’t really technically- when push came to shove she would not have been really the owner of her company. And she didn’t even know until we got into the nuts and bolts of her certification. So you were able to alert her to this fact and she was able to course correct. Wow, that’s really interesting. And I’m sure that that is probably more common than we might think. Oh it is very common. I mean I have clients whose partner passed away ten years ago, and they’re still 50% owner. Well I don’t think they’re making some of the decisions now. But they’re still on the ownership paperwork. And I’ve seen them still on the tax returns years after they’ve passed away. It’s a great housekeeping tool, on top of everything else it will bring you. I know when I’m talking with people about certification the number one thing I bring up is if you’re going to try to complete this process yourself, you just need to be very organized. Because I find that if you’re really detailed and really organized and you have all of your paperwork ready, the process itself is still a little bit daunting but you can muddle through it versus someone who’s unorganized and doesn’t have any of their paperwork in check. Hiring a company such as yours would absolutely be a really good use of their time and money. Yeah, even if you’re the most organized, it’s still a daunting process. But you know, and each of the certifications have their own pieces that are more difficult than a different process. But if you happen to be one of those very OCD people, things in order, tabbed and ready to go, and every month you work on- you update your financials, and every year you have- you update your corporate documentation, then I could see how certification could be doable internally. And if you add a little bit of extra time, you could do it. But for the most of us, for the normal person, the normal entrepreneur, the normal successful entrepreneur, that’s just not the case. Like when was the last time most of us looked at our bylaws or our operating agreements? Signed them when you incorporated, exactly. So it is a matter of being very organized but you know this packet that you get together is the same information that you have to bring to a bank to get a line of credit or a loan. It’s the same information you have to bring a lot of places, so it’s just good information to have. So as I mentioned a by-product of this housekeeping tool is excellent because you have this package of information that you will need for various tools on your entrepreneurial path. That’s excellent, excellent advice and such good key points. And as I’ve said a couple of times, I will make sure that I’m putting links and this information on the website and you’ll be able to find it on the website at www.JennTGrace.com/008 because it will be episode number eight. So as we’re nearing the end of this interview, I do want to ask you one final question. And I’m always excited to hear the responses I get from people because as entrepreneurs and business owners, there are always so many things going on, and in your case you have been a juggler, so many balls in the air at once. But what is one thing about your business right now that’s just really exciting, or what is one thing that is about to come through for you that’s just really exciting and has you raring to go? I think the most exciting thing for us right now is that- and I kind of mentioned this earlier is that supplier diversity for so long was just its own little program within a company. And now it has the chief procurement officers of pension. They’re telling their procurement people, “You need to incorporate diverse suppliers.” It’s very exciting because before, a lot of times people would say, “Oh I met with so-and-so from this company, the supplier diversity manager, and they said I should speak to you,” and the procurement people had no idea what they were talking about. They’re like, “Supplier what? Who are you talking about, what are you talking about? Diversity certification?” Like it was foreign to them. So the fact that it’s now on the radar of the chief procurement officers of some very large Fortune 100s, Fortune 50s, Fortune 500 companies is very exciting to me, and it should be very exciting to all diverse suppliers. This really means that they understand the benefit, the value of working with diverse suppliers. For so long people thought it was a social responsibility. Oh, it’s a feel-good piece of the company. No way, now even the chief procurement people realize it is good for the bottom line to use diverse suppliers. Absolutely, I couldn’t have said it better myself, that’s awesome. So thank you so much for taking your time out of your day today. Is there anything that we have yet to cover that you want to bring up now before we say goodbye? Well I could talk about this subject for about ten hours, but I don’t think anybody here wants to do that right now. Maybe in a follow-up episode. So I would say there’s so many pieces to the puzzle, it’s just a matter of understanding how your business and your position fits into the big puzzle and that’s really the best way to go forward, and just to remember it’s not instant gratification, it will take some time. So just keep plugging away and don’t expect overnight instantaneous- if you certify it they will come type of responses and reactions. And good advice. So again, thank you so much for taking time out of your day. Why don’t you give yourself one last plug and let people know how they can find you. Sure, so we are Certify My Company, our website is www.CertifyMyCompany.org, and our Twitter is CertifyMyCo. So we do have a Facebook page, it’s Certify My Company, and you can find me on LinkedIn under Heather Cox with Certify My Company. And please feel free if you have any questions to reach out to us via email, you could email info@certifymycompany.org and one of us will get back to you. Because it is a very overwhelming subject and there are a lot of acronyms and a lot of words that don’t come up in everyday conversation, so in order to demystify it I’m happy to answer questions and take additional questions, and help people out in any way that we can. Excellent, and I will make sure that I include all of your contact information on the website at www.JennTGrace.com/008. So thank you for joining us, and I look forward to talking to you soon. So that wraps up my interview with Heather Cox, I hope you enjoyed it. In just a moment I will share with you who the expert interview for May will be, and I will also let you know the date of my next live webinar. But before I do I’d like to play for you a quick word from my sponsors at the Human Performance Academy. Thanks for those words from Mike over at the Human Performance Academy. If you haven’t had a chance to check out their website, I strongly recommend you do. They have some amazing content over there. And now I want to share with you who the next expert interview will be. So in May I am absolutely pleased to be interviewing Justin Nelson, the cofounder and president of the National Gay and Lesbian Chamber of Commerce. This is bound to be a great interview in which we will discuss many things related to entrepreneurship, leveraging LGBT status in business, and talking about the upcoming NGLCC conference in Dallas at the end of July. So definitely check back, if you haven’t yet subscribed to this podcast, you can certainly do so in iTunes and I will leave a link to do that in the show notes of this episode. 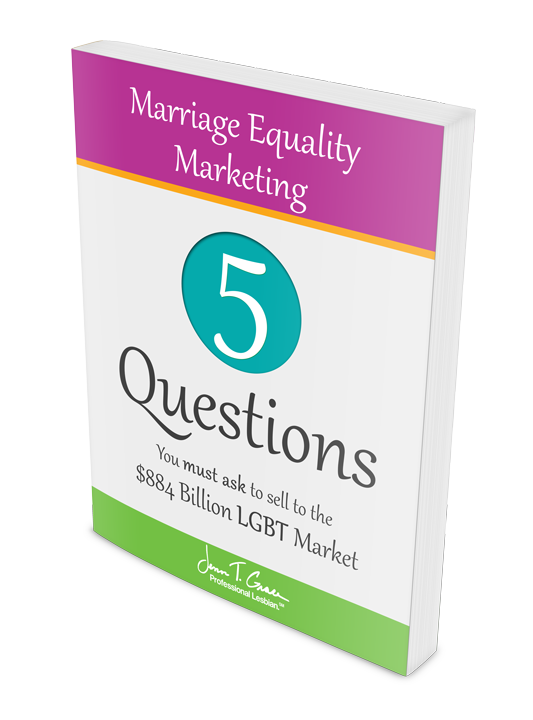 And finally the next webinar will be on April 30th from 1:00 to 2:00 PM Eastern Standard Time, and it will teach you about doing business with and marketing yourself to the LGBT community. One of the best parts about this live webinar is that we do have a Q&A at the end of the webinar, so it is certainly your chance to ask me any questions that you may have. 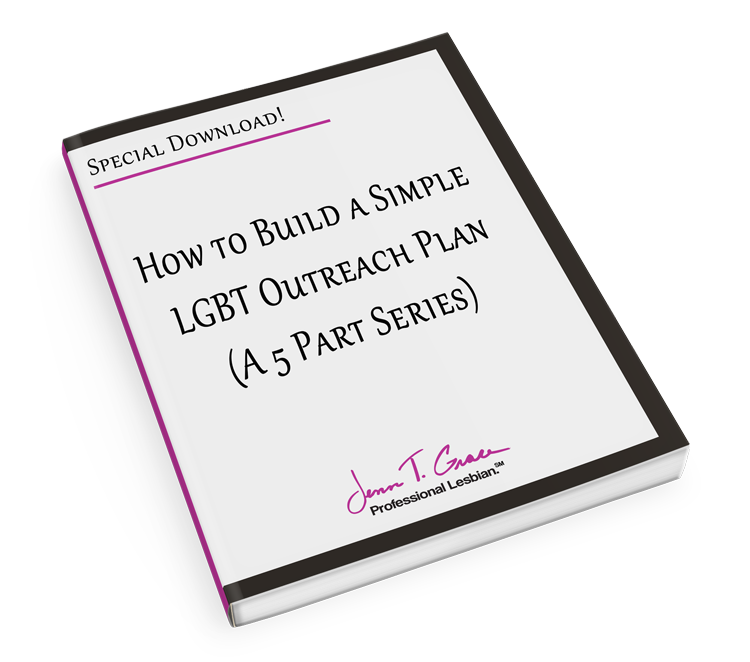 And you can RSVP for this webinar by heading over to the website at www.JennTGrace.com/webinars. As I mentioned before, you can see the show notes to this episode and find all of the links mentioned on air at www.JennTGrace.com/008. As always, thank you so much for listening. If you’ve enjoyed what you heard, I encourage you to leave me a review in iTunes or pass this along to a friend or colleague. If you would like to reach out to me, please do so, you can find all of my contact information on my website at www.JennTGrace.com. Talk with you next time.